Hotline is a 5 reel, 30 paylines slot game based on the American television crime drama, Miami Vice. The graphics are great and are filled with the favourite characters from the show and the music is very fun. As you cruise along the long and windy roads of America, you'll see some beautiful scenes. Scenes of tall palm trees, sunset skies, and bright lights. Hotline comes with an entertaining set of features including expanding wilds and respins. Hotline is a 5 reel, 30 payline slot developed by NetEnt. It's based on the hit TV show Miami Vice with a design that has a very retro, 80s feel, it is one of the best promotion slots. You'll feel as though you're part of the show as you cruise along the streets in your retro red sports car, living a life of luxury for the day! Behind the reels, you'll see a stunning Miami landscape with long open roads, tall palm trees, sunset skies, bright lights, hotels, and clubs. 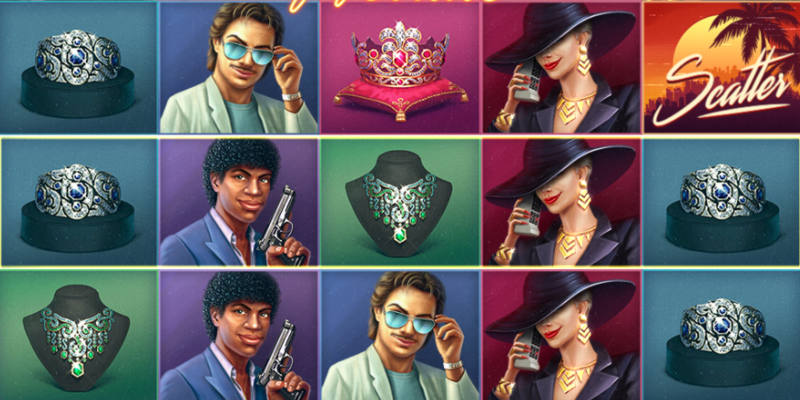 The symbols include glistening tiaras, fancy jewellery, and 80s characters including a gangster and cop with a gun. The Wild Symbol - The wild symbol in this slot is the red sports car. The car can appear on any reel and replaces all other symbols apart from the scatter to create winning combinations. The Hotline Bet Feature - To up your chances of winning even bigger and better prizes, you can activate the Hotline bonus bet feature. There are 3 Hotlines available, with the third Hotline costing 45p at minimum stakes. The higher you bet, the more chance you have of activating expanding wilds and respins. Landing a wild symbol on an activated Hotline will expand and cover the reel entirely with wilds. The re-spins feature will also be activated here and you'll receive a free respin with expanding wilds. Landing new wilds on any activated hotlines will award you with even more free respins and these expanded wilds will stay sticky until all the free respins have gone. The Scatter Symbol - The scatter symbols is the sunset. Landing 3 scatters on reels 1, 3 and 5 will activate the free spins feature. Once unlocked, you'll be given 7 free spins. When a wild lands on an activated Hotline, it will expand and stay on the reels until the feature has finished. Hotline takes you on the ultimate American road trip where you collect some great prizes en route. The theme is innovative and the 3D animations are very well done. To increase your chances of winning big and triggering features, it's definitely worth activating the Hotline bonus feature. Or you could play another Easy Slots game that offer slots bonuses UK.